The data from the numerous measuring instruments (seismometers, tide gauges, GPS instruments) converge in the Warning Centre in Jakarta. Here, they are evaluated and processed by specialised and partially newly developed sensor systems. Furthermore, a simulation system is available in the Warning Centre, which can access a large database with pre-calculated tsunami scenarios for the Sunda Arch and can select the most appropriate scenarios within seconds on the basis of current sensor measurement values. This database has been updated and enhanced several times over the years. A second simulation system makes it possible to calculate the tsunami effects of a seaquake for another larger coverage areas in lower detail online. 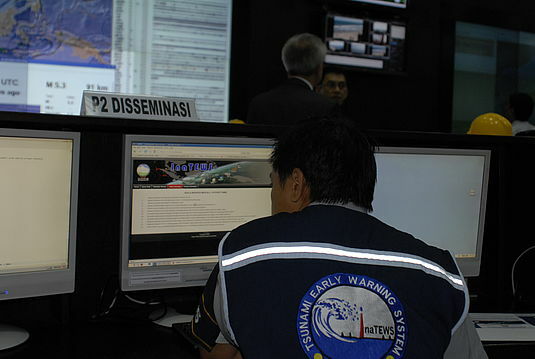 To support the warning room staff with the assessment of whether a tsunami has been generated, when and where which wave height can be anticipated and whether and which coast-specific warning information needs to be issued, an innovative Decision Support System (DSS) has been developed and put into operation. The DSS has extensive databases regarding geobasis, risk and vulnerability data and can create a situation status and generate decision-making recommendations on the basis of pre-processed sensor data and using both simulation systems. 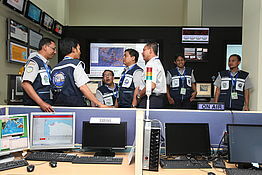 If the warning room staff issue a warning, the DSS produces relevant warning products that are forwarded to the disaster protection authorities, emergency services and media. These can be used to warn the population quickly and in a targeted manner and evacuation measures can be initiated. The potential of state-of-the-art earth observation technologies in the event of a tsunami disaster has been evaluated on the basis of studies. The system has been in operation since 2008 and has been optimised and further enhanced since then. The DSS, approved for operational implementation since August 2010, was adapted on the basis of the practical experience and requests of the operators. 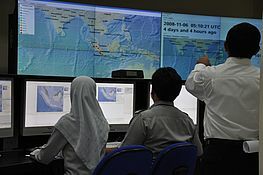 Among other things, the database has been updated and significantly enhanced with new tsunami scenarios and a DSS upgrade was put into operation in October 2011 to supply all countries bordering the Indian Ocean, which allows Indonesia to administer the role of a UNESCO/IOC Regional Tsunami Service Provider (RTSP). From this work station, the warning alerts are distributed nationally and internationally. In the control room of the BMKG national warning centre, the measurement data is analysed and evaluated. This allows for hazard risk determination of individual coastline sections. The control room is staffed around the clock. Shift supervisors, operators and support staff work in each shift of this so-called 24/7-service. 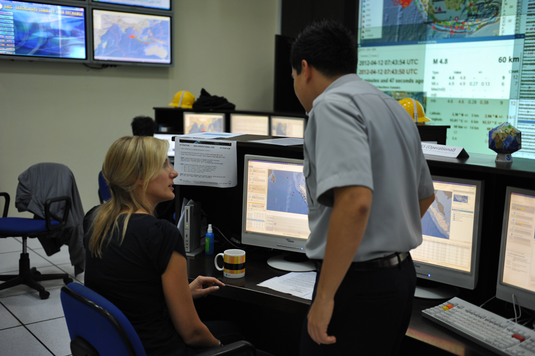 German experts in the warning room of the Tsunami Early Warning Centre in Jakarta conduct system optimisations and support the staff with training measures.